This holiday season, I plan to take a lot of time out of my busy gift-buying (more on that later), exercise, and work schedule to put on my apron and bake massive quantities of sweets for my loved ones. I had plans to attempt this last year (in my tiny downtown kitchen with mini-stove and no storage space). Grand, grand plans that never came to fruition. I did, however, attempt and achieve baking what might possibly be the yummiest cookies in all the land, some scrumptious almond Sandies-type cookies from a Martha Stewart recipe. They were divine, and my family, friends and I ate them all up before I was even able to put the finishing touches on them. divinity, a family tradition carried out by my grandma until her death. I’ve made it a few times since then, but this year I’m going to start it as a yearly tradition. Have any favorite recipes you’d like to share? 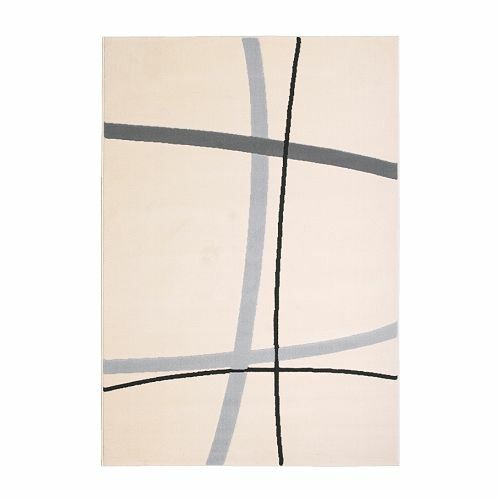 We’re trying to find a replacement rug for our living room, and I’m finding it a little difficult to locate one that won’t break the bank but will also leave the room open to future design choices. The rug we currently have in the living room is some cheapie deal that Kevin probably bought for $20 at Wal-Mart. It’s a neutral blue and is about 6’x4′. It’s also thinner than hell and doesn’t do much in the way of acting like padding for our feet or keeping us warm from the cooler hardwood floors. As far as decor in the room, we’re hoping to slowly replace all of the more “college apartment” items with things in a more retro vein. So far, we’ve gotten rid of a super junky couch (hope you’re enjoying it, Sarah!) and replaced it in the room with a great little bookcase with angled legs. We also replaced a gross reclining chair that wasn’t used by anyone except the cats with my fabulous red ikea chair (which has since been discontinued and of which I can’t find a picture online). I’d kind of like to bump up to the next size, though, which is 5’x8′. We tried looking at Menards, but their selection of cheap rugs was pretty gross. Seen any neat rugs lately?